No matter if this is your first home or not, you likely can benefit from a bit of lawn care training. What do you need to do to this lawn to get it to the point where you will be happy with it? There are many resources that can help you to get it the way that you want to. During the first months and even years of owning your property, you will be able to fine tune your abilities with fertilizing and caring for your lawn in general. When you pay attention to it, your lawn will do well under your guidance. You may want to talk to your neighbor that has a great looking yard for some advice. They will have the same soil and other factors as you do, therefore giving you a great starting point. 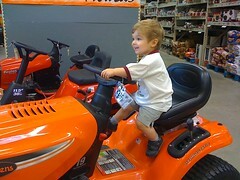 You may also want to look for lawn care training from your local gardening shop or home improvement store. Ask about the types of plants that do well in your area and be sure to ask about all of the tips they can give you with maintaining your yard. Your local extension office can also provide you with the tools you need to maintain a healthy and productive yard. Some offer websites that can be helpful to you as well. For those of you who prefer gardens that thrive on neglect” or do not have time for intensive gardening, try summer bulbs. May is the time to plant these. The results one achieves from planting these are marvelous. The common garden canna is truly a hardy member of this group. The dormant rhizomes are usually available in nearly every garden store. Look for vigorous varieties and fast growers. Clusters of bright red flowers are produced in quantity. Do not forget a good pink while or small-flowered oranges with bronze foliage. The foliage is as valuable as the flowers, in fact with many gardeners it is more valuable. In our area the rhizomes should be dug and stored for the winter. A favorite summer bulb for many gardeners is the gladiolus. These old favorites have come a long way and with the new varieties that will grow to six feet… perhaps more than staking will be necessary. To me one of the most gorgeous of summer bulbs is trigridia, sometimes called Mexican shell flower. Plant these bulbs about four inches deep during May in rich soil and full sun. Sure, it may still be rainy and chilly outside, but spring is officially here and it’s never too early to start thinking about summer home improvement projects. By starting early you can actually take advantage of some early sales, get a better idea of what you want to do and even finish your projects early enough to enjoy the summer months! Clean and Inspect Your Rain Gutters: The gutters of your home probably took a beating through the winter months. Ice and water and all sorts of debris from late fall can do quite a number on gutters and if you haven’t replaced them in a while. You may may want to check them over for cracks or weak points. A leaky gutter could sending water against your home and that can cause wood to rot around your roof line. Do not sow seeds on bare areas that are packed down hard and smooth in the Midwest during March. These areas should be loosened four or five inches deep, pulverized (and raked even before seeding. Grass seeds sown on snow are usually wasted unless the ground was prepared for accommodating the seeds before the snow arrived. The quantity of seeds to be sown should be divided and half sown in one direction and half in the opposite direction to obtain an even distribution. The entire seeded area should be raked lightly to cover as many seeds as possible. A light top dressing of screened mushroom soil will cover the seeds and produce a condition favorable for germination and growth. Mushroom soil can be obtained from local soil service companies. A light rolling is then beneficial to give the seed close contact with soil particles in order to hasten germination. It frequently happens that the first two or three weeks in March are so snowy and rainy that the soil is never in the proper condition for raking. When this condition exists, rather than wait too long for spring seeding, seeds may be sown and later given a light top dressing with prepared compost or mushroom soil just as soon as it is dry enough to use. As part of the renovation nation we bought a my parents home built in the 1950′s and it had a landscaping problem. The parents wanted something different. To keep the grass and weeds from creeping in from the lawn they decided to put the flowers in stone and concrete beds. This would give a bed above lawn level and required less upkeep. The first step they took was to build a wooden form the desired length, height and width. The beds were raised about five inches above lawn level. A second form was built three inches smaller to fit inside the first form, and in which the concrete is poured. After the forms were built they used the outside form as a guide to dig a trench about six or seven inches deep by three wide. This trench acted as a form for the foundation and was below the frost line. The forms were then secured above the trench and ready to pour the concrete. Ready-mixed concrete was used but mixed most of the beds using one part cement to two parts sand and a little lime which gives the beds a white appearance when set.